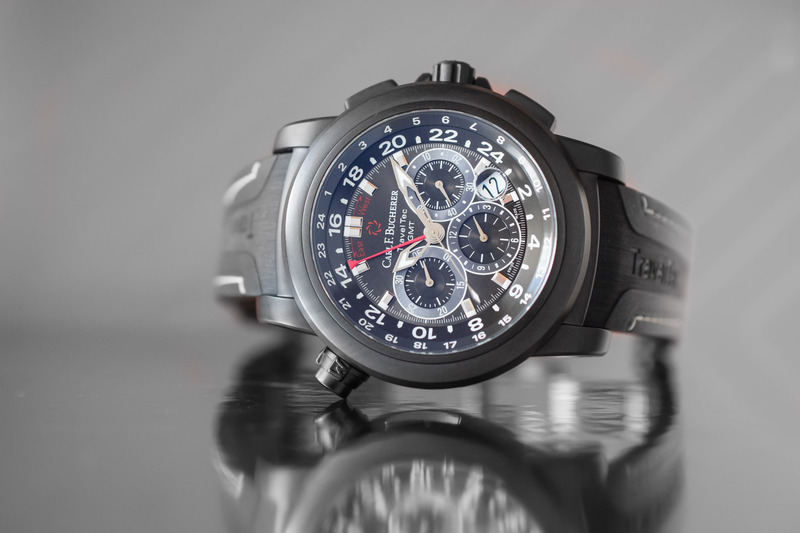 Three time zones, a chronograph, and a case that can handle real life travel conditions in style. 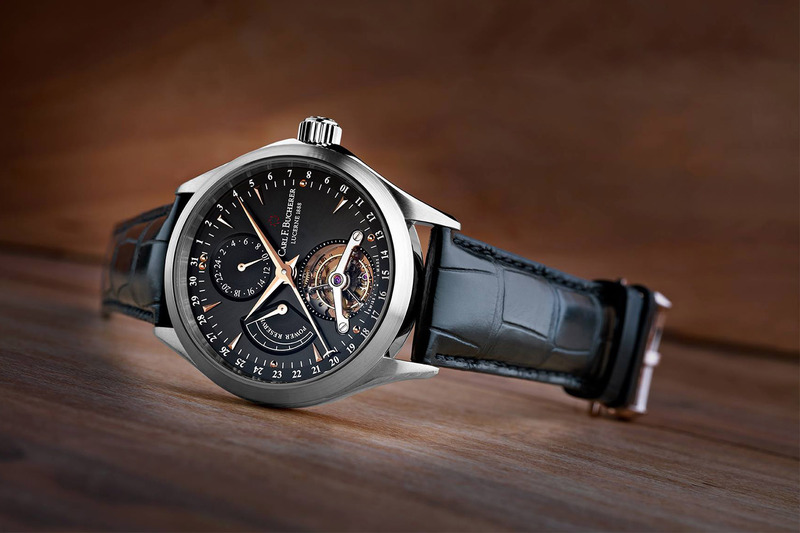 The TravelTec is one of the few watches in the business whose name actually matches its functions: a highly technical travel watch. 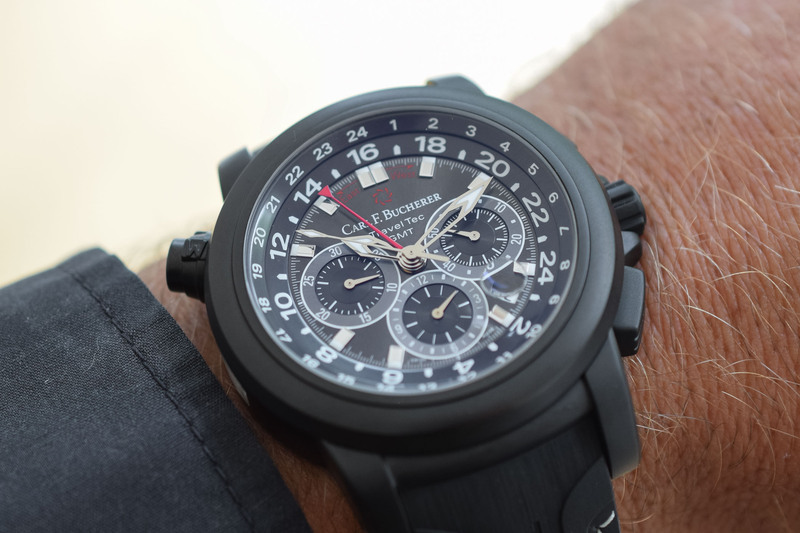 Carl F. Bucherer’s Patravi TravelTec upped the antes in the GMT arena when it was introduced in 2005 with a movement capable of displaying three time zones coupled with a chronograph. 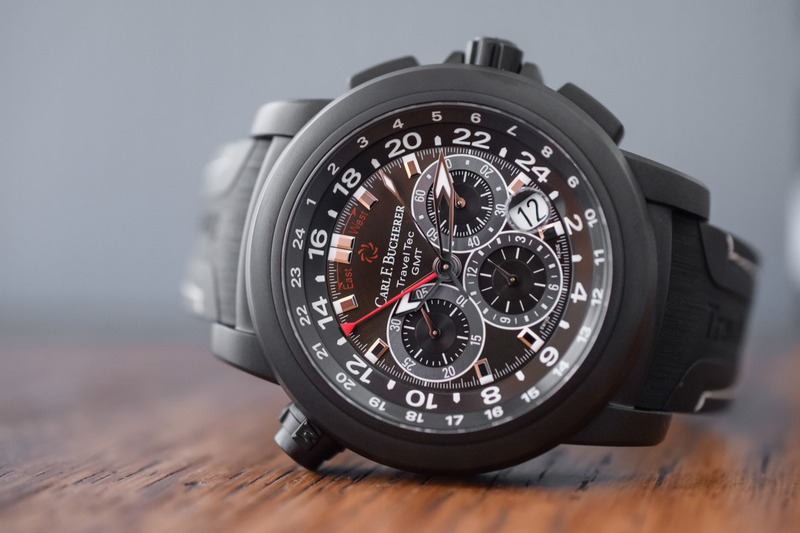 Now the globetrotting star of the Patravi collection, the TravelTec has adapted to the changing panorama of materials and also comes in this sleek matte black version with an integrated rubber strap. 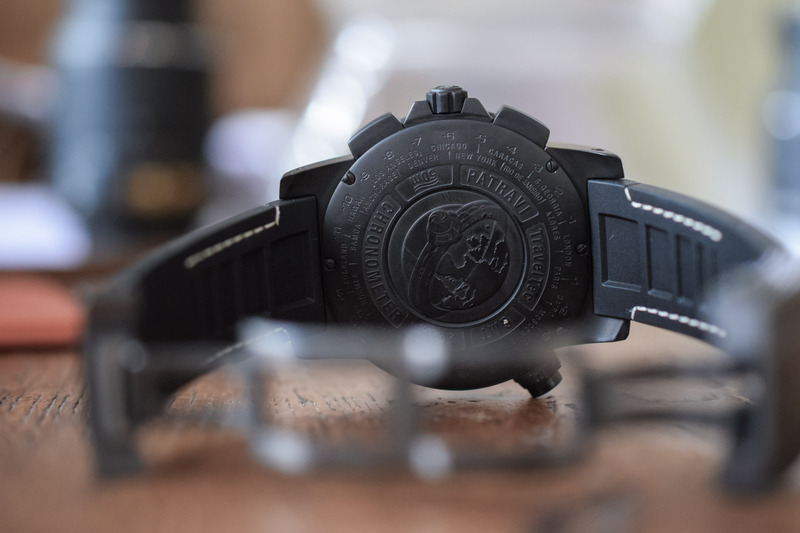 Although the designers might have had stealth aesthetics in mind with the dark DLC finish, this multi-purpose 46.6mm piece will not fly under the radar. 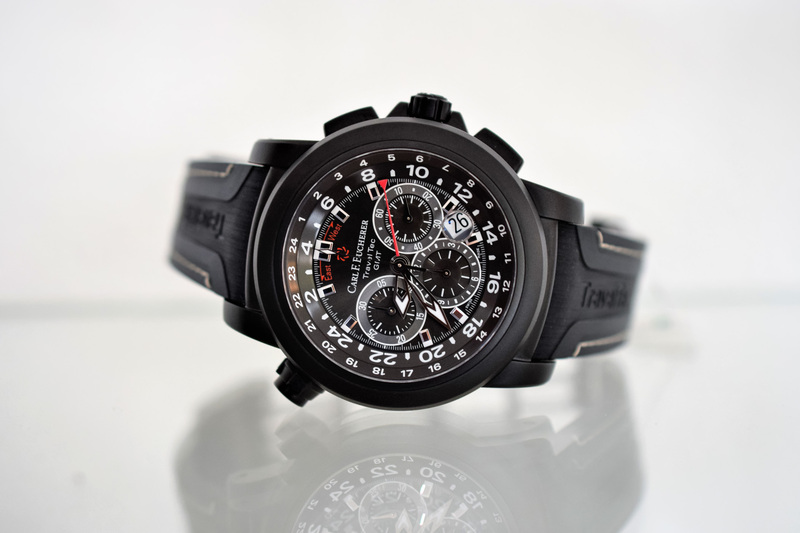 Endowed with brawns and brains, the powerful masculine case of the TravelTec Black houses CFB’s automatic chronograph movement. Like an expensive polycarbonate suitcase that emerges on the luggage carrousel in perfect condition, the scratch-resistant black DLC coating of the Patravi can take a lot of wear and tear and still look great. Applied in multiple stages, the wafer-thin diamond-like crystal carbon is not only scratch-resistant but also highly shock absorbent protecting the mechanism from accidental blows – or careless baggage handlers. The first impression of the TravelTec case is its generous rotundity and reassuring weight. Despite the impressive dimensions of the stainless steel case – measuring 46.6mm in diameter and 15.5mm thick – the effect of the matte black DLC lends the watch a contemporary, sleek mood and is probably a better frequent flyer than the TravelTec II rose gold version of this watch. Furthermore, despite what the dimensions let you think, it wears much better that one would expect. The watch features rectangular chronograph pushers on the right and the patented CFB pusher at 10 o’clock to set the third time zone. Designed with user-friendliness in mind, the monopusher lets you adjust the third time zone in satisfying one-hour jumps in either an easterly or westerly direction and is extremely agreeable to manipulate. By unlocking the crown at 10 o’clock, the pusher is released letting you adjust the time in one-hour jumps. But how do I know if my desired time zone is east or west, plus or minus GMT? The TravelTec has solved this with a very useful engraving on the caseback of different cities and their plus or minus deviations from GMT. Although the caseback is sealed, a great detail is the rectangular window located just underneath the pusher on the caseband allowing you a peek of the patented GMT adjustment mechanism. Featuring a screw-down crown and sealed caseback, the watch is water-resistant to 50m, suitable for showering or even a splash in the pool. Available on a rubber strap with white stitching or a stainless steel bracelet with DLC coating, the watch is secured firmly to the wrist with a double deployment clasp. 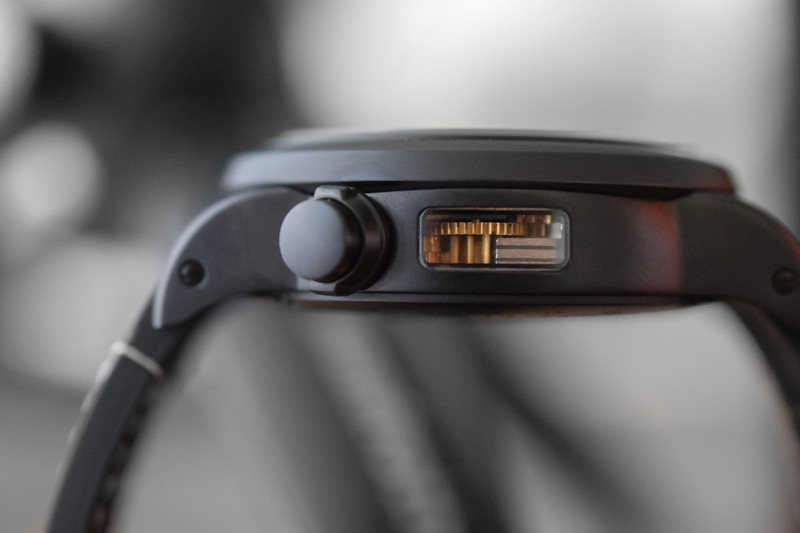 The short sloping lugs sit well on the wrist and are fixed with screws – not spring bars – for additional security, an important consideration for a watch of these dimensions and weight. There is no escaping the fact that this is one hell of a busy dial and requires some time and patience to decipher. 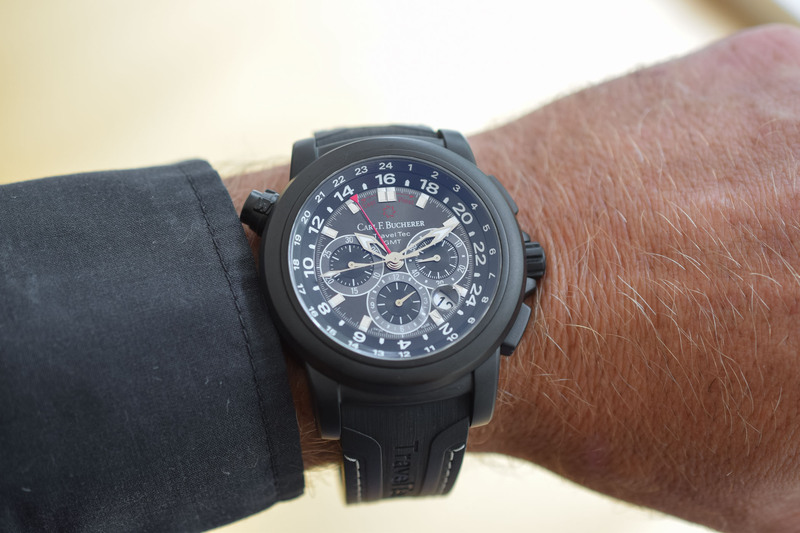 Unlike the previous TravelTec II model that relocated one of the double 24-hour rings from the dial onto the bezel freeing up the dial somewhat, this model compresses two 24-hour scales, two chronograph counters, a running seconds counter, indices, minutes track and date window plus loupe on the dial. It’s a bit of a mouthful at first but once you have understood the cartography it becomes much simpler to read. The black background with abundant white markings receives a refreshing splash of red – used to highlight the third time zone hand and the east/west indication – relieving the somewhat intense black and white scenery. As with most traditional GMT watches (read here for our in-depth report on GMT and World Timers), the local time is displayed centrally and set using the skeletonised hands with their sharp luminescent tips. The second time zone is located on the outermost 24-hour scale with smaller white Arabic numerals and is set at the crown in position 2. This scale is fixed and is used to indicate home time. (I still find that my brain wants the second time zone to be on the larger 24-hour ring, but once you get your head around the fact that your home time is not going to change, it starts to make sense.) The third time zone is indicated by the larger rotatable 24-hour scale located directly above the hour indices with large white Arabic numerals and signalled with a red hand. The red hand features an inverted triangle that hits the 24-hour scale squarely and firmly, so there is no doubt which of the two 24-hour tracks is being signalled. By releasing the locking pusher at 10 o’clock, the adjustment mechanism of the third time zone kicks in and the firm click as the hours jump in either direction is very satisfying. The chronograph is activated by two pushers on the case with the start/stop pusher at 2 and reset functions at 4 o’clock – traditional. The chronograph seconds hand is mounted on the central axis and the 30-minute sub-dial is at 9 and the 12-hour counter at 6 o’clock. Despite all the efforts made to render elapsed times as legible as possible, I still found it hard to get past all the other information on the dial. The three counters are squeezed into the reduced central area and caged in by imposing facetted block hour indices and a white minute track. However, my feeling is that the primary purpose and appeal of this watch is the triple GMT function and that the chronograph complication, no matter how sophisticated, is relegated to a secondary role. 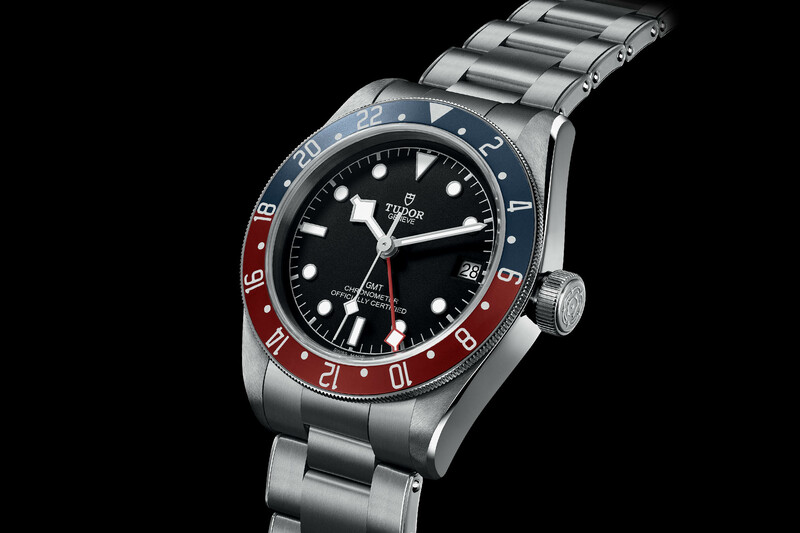 Although many of us quibble with date windows, I believe that on a GMT model the date is a useful ally. Flying through different time zones and the resulting jet lag are compelling enough reasons to want to be sure of the date and the TravelTec has kindly provided a magnifying lens so that you don’t have to squint. The time can be adjusted at the crown (position 3) and there is also a quick set function (position 2) moving the hour hand in one-hour increments both forward and backwards. The date will follow along when adjusting the local time and, another nice touch for travellers, it can be adjusted using the quick set function of the crown. 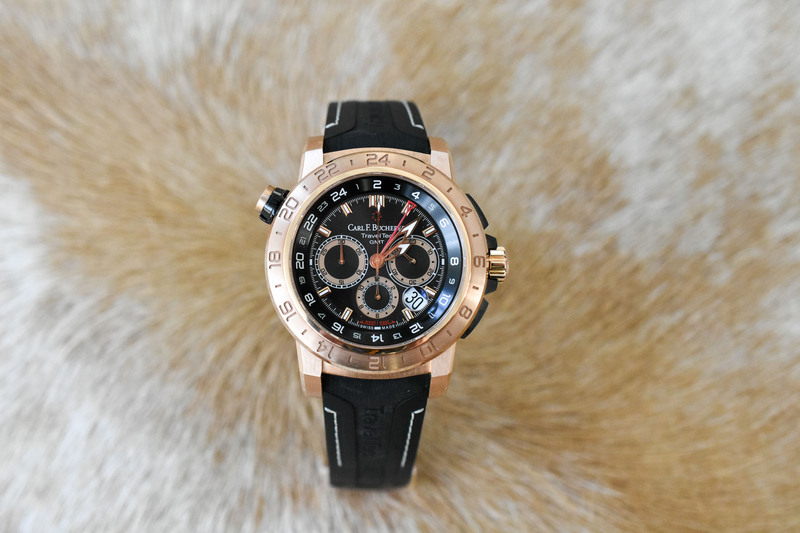 The Patravi TravelTec is powered by the automatic calibre 1901.1. 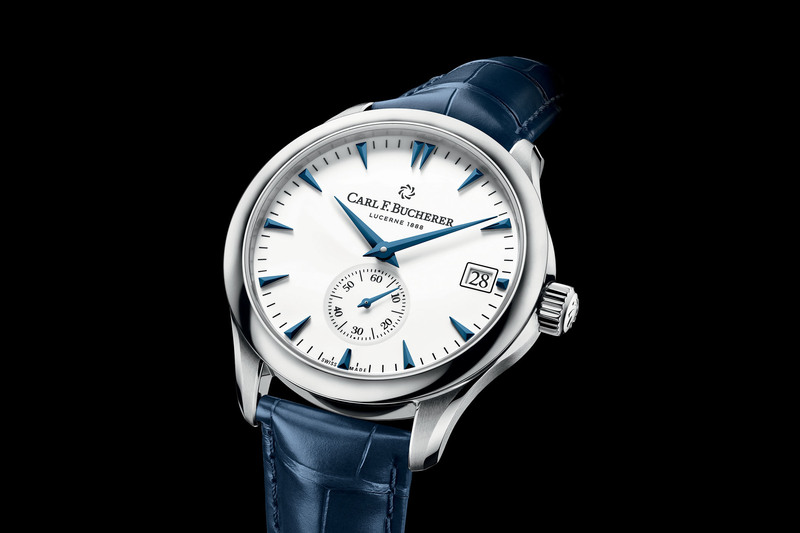 Developed for Carl F. Bucherer by Techniques Horlogères Appliquées (THA), the movement was launched in 2005 and THA was incorporated by CFB in 2007 leading to the birth of the brand’s own Manufacture. The movement is based on the ETA 2894 chronograph module with a 3-6-9 sub-dial layout for the running seconds and chronograph registers on top of the tried and tested ETA 2892. The chronograph module features a vertical clutch for smooth operations and the hacking function allows you to synchronise the small seconds. 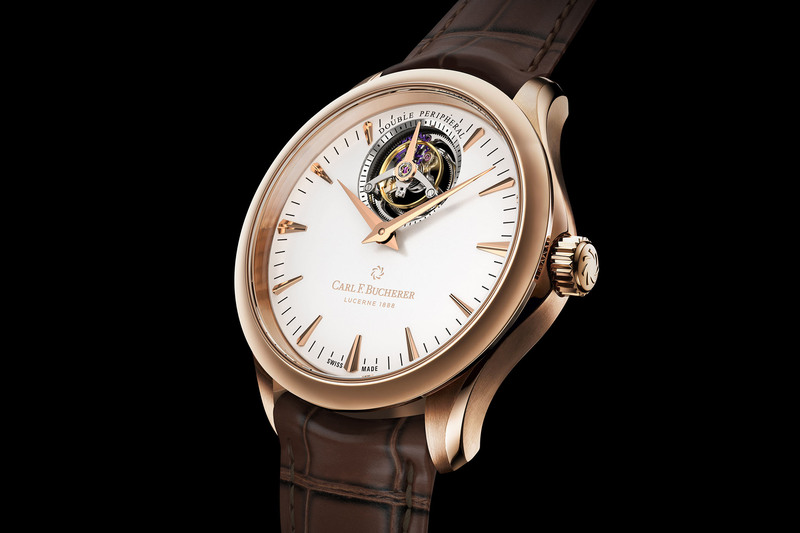 The entire movement has been substantially modified by Carl F. Bucherer to accommodate the additional time zone indication, and the possibility to adjust the hour hand in one-hour increments. It runs at 28,800 vibrations per hour, can store 42h of power reserve and is chronometer-certified by the COSC. The movement is partially visible through a sapphire window on the side of the case. 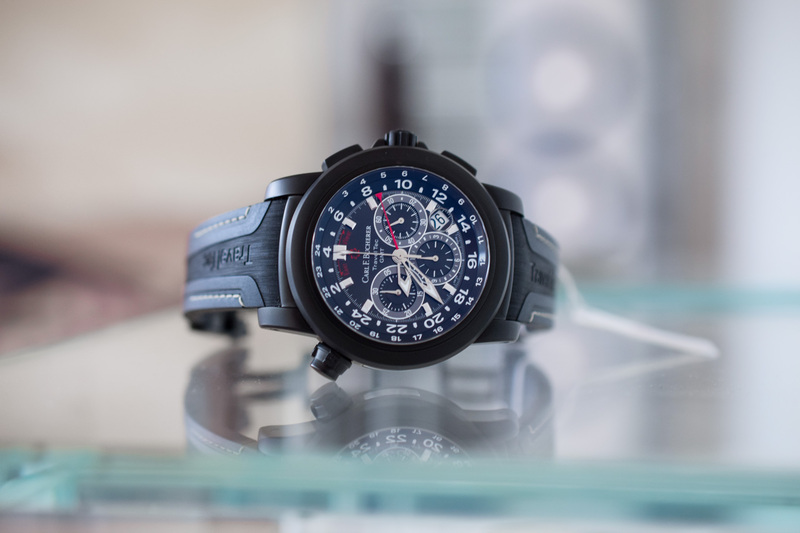 With the display of three time zones and a chronograph on board, the TravelTec Black goes well beyond the duties of your average GMT and is fitted with practical, easy-to-manipulate functions that will make life smoother as you hop across time zones. The patented monopusher on the case lets you set the third time zone in either direction while the black DLC finish on the case ensures a sleek matte look that won’t get scuffed on the move. Yes, it is a big watch with a busy dial. And yes, it is conspicuous… but it is not pretentious. And this, in my eyes, is a huge plus. The finishes, as you would expect are top-notch and in line with CFB’s luxury philosophy but perhaps the appeal of the TravelTec is that it is light years ahead of most GMT models on the market and has a unique, confident personality that spells out ‘independent watchmaking’. The Patravi TravelTec on a black steel PVD bracelet retails for CHF 14,500, the version on a black rubber strap retails for CHF 12,800. 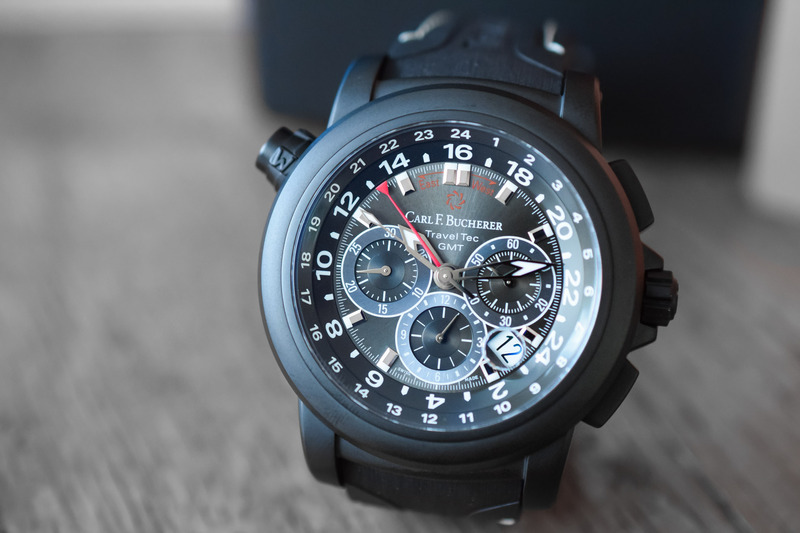 For further details, please consult carl-f-bucherer.com. Movement: Calibre CFB 1901.1 mechanical with automatic winding – 28.6 mm – 42h power reserve – 28,800 vibrations/h – 39 jewels – hours, minutes, seconds, date, chronograph, three time zones -COSC certification. I like the look of this watch but have two issues with it. At 46+mm this is too big for many wrists. An ideal travel watch to me should be sporty enough for casual use but can also be worn under a cuff for dress situations. Second is that 50m WR really isn’t supposed to be taken in a pool, lake or ocean according to most manufacturers’ recommendations. I think 100m would be perfect and then there wouldn’t be the risk of leaving it in a hotel safe. It’s like a Breitling and a G-Shock got together had a baby. Sadly, the child didn’t inherit the water resistance gene. It’ll also grow up being bullied at school thanks to that ghastly date window.